My husband and I are currently on a little vacation, our first getaway in well over a year! We are celebrating our 10th wedding anniversary and since we had to stay fairly close to home due to my husband's job (he could be called back at any time) we decided to hop on down to Vegas. Yesterday we went to brunch at Thomas Keller's Bouchon and it has to be one of my favorite spots in this sparkly, over the top town. 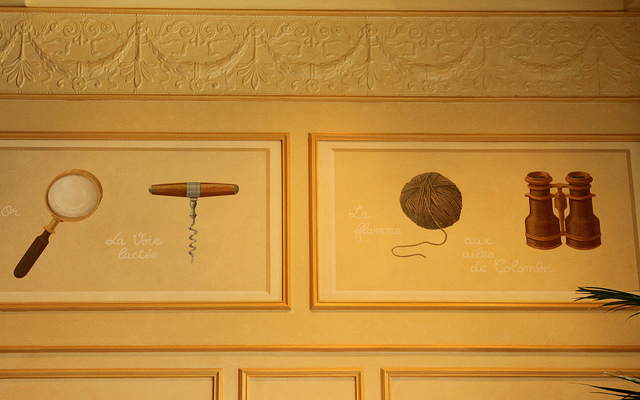 It is very elegant and I loved the charming French paintings on the wall. Oh and the food -- amazing! I've had this place on my list for quite a while and last time I thought the kiosk bakery was it, but I'm very happy to find out there is an actual bistro thanks to Bonnie. We will definitely be hitting this spot every time we come this way. What are your favorite must-hit spots in or near Vegas? Happy 10th Anniversary! May you have many, many more happy anniversaries to come. and my number one rec: china poblano at cosmopolitan for either lunch or dinner!! We ate there for our 5th anniversary last summer and it is one of those legendary meals that we think back on as being nothing but magical. The entire experience from walking in the door to the bread to the meal itself. 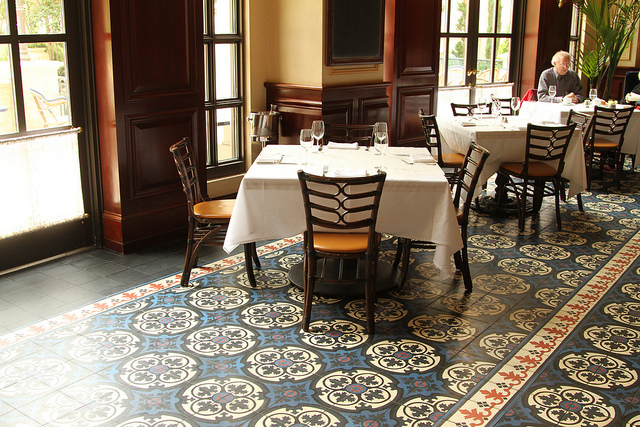 Ohhh, and those tile floors! I die! Nobill Tavern at the MGM Grand is my dinner fave! happy 10th anniversary!! that is a big one-congratulations to you! my husband and i are celebrating 10 years in october too. cheers to a decade together! We are from Vegas and I have never eaten there. It looks amazing. We really like Kennedy's at the District and the creme brulee at Brio (town square)! Happy 10 years, wow! yes!! I've been there too and looooved it. I love how they ask if you want to start with a course of mini donuts. Happy Anniversary! Those waffles looked so sumptuous! I'm jealous! You are very lucky one. Those waffles look like perfection. Congratulations on the anniversary! Happy 10th ani! These bistro shots make me want to go out for a relaxing brunch in a big way! happy 10th anniversary! wishing you many, many, many more anniversaries. Yum! Love the decor and the waffles look so good! Making me hungry. happy Anniversary! Have fun! happy anniversary Rachel! this place looks perfect. 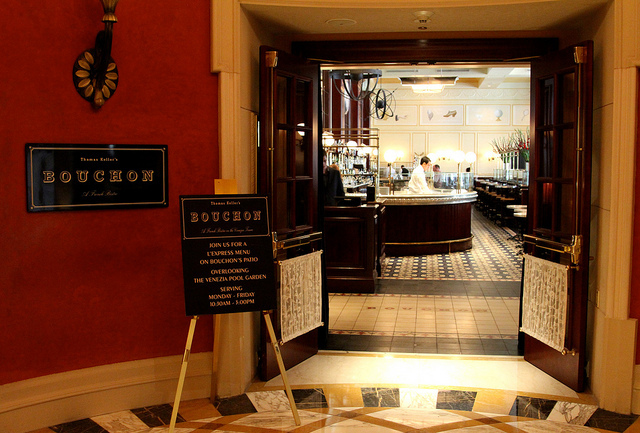 This is my favorite Bouchon location and one of my fave spots to go in Vegas. Glad you had a lovely time! 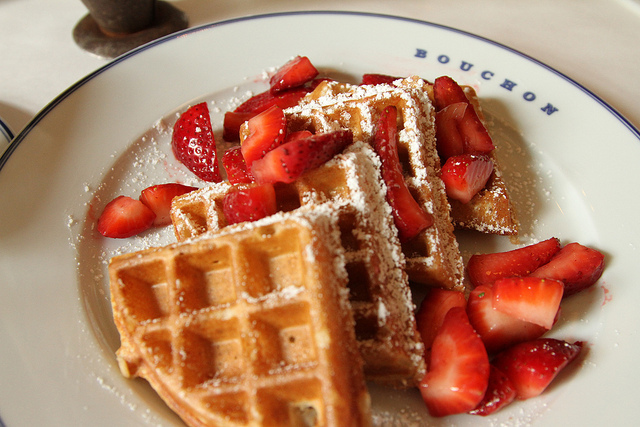 Ah, I went to Bouchon in Vegas a couple years ago... We went for breakfast and it was such a treat! I live in California but have yet to try the one in Yountville. We have lived in Vegas for two years now and dinner at Bouchon is high on my list of things to do before we move. I have had their weekend brunch, which was incredible, and a ton of macarons from their kiosk, but haven't made it to dinner yet. Some of my favorite spots: Dos Caminos for upscale Mexican in the Palazzo, Wolfgang's Postrio in the Venetian, the view at night of the Strip in the booths from First Food and Bar (food is okay).